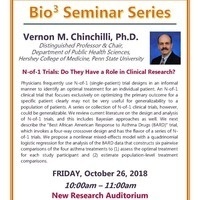 Title: N-of-1 Trials: Do They Have a Role in Clinical Research? Abstract: Physicians frequently use N-of-1 (single-patient) trial designs in an informal manner to identify an optimal treatment for an individual patient. An N-of-1 clinical trial that focuses exclusively on optimizing the primary outcome for a specific patient clearly may not be very useful for generalizability to a population of patients. A series or collection of N-of-1 clinical trials, however, could be generalizable. We review current literature on the design and analysis of N-of-1 trials, and this includes Bayesian approaches as well. We next describe the “Best African American Response to Asthma Drugs (BARD)” trial, which invokes a four-way crossover design and has the flavor of a series of N-of-1 trials. We propose a nonlinear mixed-effects model with a quadrinomial logistic regression for the analysis of the BARD data that constructs six pairwise comparisons of the four asthma treatments to (1) assess the optimal treatment for each study participant and (2) estimate population-level treatment comparisons.